As noted here previously, James Hansen was awarded its highest honor by the American Meteorological Society for his climate research and communication. Even a major denialist blog offered congratulations, but an ex-colleague at Capital Weather Gang (formerly CapitalWeather.com) inexplicably raised the bizarre question of whether "Science Group Erred Giving Hansen Top Honor". The post is inexplicable, that is, unless it was a crude attempt to get linkage during a season in which the CWG's target age demographic of 12-14 has been mainly out of action as a result of the ongoing Beltway snow drought. DotEarth's Andrew Revkin, whose own cluelessness is frequently on display, took the bait, raising the absurd question, "Can a Scientist Be a Citizen, Too?" CapitalClimate's comment submitted to Revkin's post is quoted below, but there are other interesting comments, as well as one that is particularly amusing. The anonymity of the signature "wmar" creates some ambiguity, but the incoherence, both linguistically and scientifically, points in the direction of one of our favorite squawk radio meteorologists. As a degreed meteorologist and member of the AMS for over 45 years, I am very pleased to see the Society take a responsible public position on an issue which has serious and far-reaching consequences to society at large. As a former member for over 3 years of Capital Weather Gang and its predecessor web site (author of PM Update Monday-Friday), I repudiate my ex-colleague's ill-advised comments. Freedman's conflation of "clear communication of climate science in the public arena", one of the stated bases of the award, with politics is naive at best. This is especially baffling in light of the fact that he professes to be a student of climate policy. If he can't understand the difference between communication and partisan politics, he should be looking for a new career field. Freedman's citing of an extremist view from one of the most biased and widely-discredited climate web sites is even more egregious. The only reasonable explanation is that this is some kind of juvenile attempt to gain approval from corporate taskmasters by promoting the same kind of "mushy middle" that you yourself have been rightly accused of advocating by Joe Romm and others. (I was personally a witness to your firm adherence to that false dichotomy in the face of sharp questioning at the DC MIT club seminar series last year.) It's no surprise that IceCrap has returned the favor by prominently featuring Freedman's post on its own main page. It's hypocritical to argue that Hansen is not qualified for an award because he is accused of having an agenda by some whose own agenda is highly suspect. (Have you investigated the sources of D'Aleo's funding, for example?) The Rossby Medal is not a popularity contest. Either the work is technically qualifying for recognition or not. Denying the honor as punishment for speaking out in the policy arena is just as wrong as denying certification to meteorologists who are not public advocates. On the other hand, D'Aleo's activity with such organizations as the Fraser Institute is far more overtly political than Hansen's. Should D'Aleo's recognition as Fellow of the AMS be questioned because of his political action? What about Richard Lindzen, an outspoken skeptic in such scientific venues as the Wall Street Journal op-ed page and the Larry King show? Are his Meisinger and Charney Awards from the AMS or AGU Macelwane Medal to be revoked? I don't think so. "My children's school was cancelled today -- Because of what? Some ice? As my children pointed out, in Chicago school is never cancelled, in fact my 7-year-old pointed out that you'd go outside for recess. You wouldn't even stay indoors. We're going to have to try to apply some flinty Chicago toughness to this. I'm saying, when it comes to the weather, folks in Washington don't seem to be able to handle things." Chicago Sun-Times: Ice storm shuts down Washington; President Obama tells city to "apply some Chicago toughness." 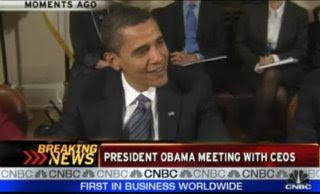 NBC Washington: Obama Scoffs: D.C. Needs "Flinty Chicago Toughness"
Jan. 28 Update: Climate Progress points out that the latest attack on Hansen by the Senator from Jokelahoma is full of made-up stuff. Naturally, the cold weather blog prints the thing verbatim (scroll down to Jan. 27). is presented to individuals on the basis of outstanding contributions to the understanding of the structure or behavior of the atmosphere. It represents the highest honor that the Society can bestow upon an atmospheric scientist. For outstanding contributions to climate modeling, understanding climate change forcings and sensitivity, and for clear communication of climate science in the public arena. The debate about global change is often emotional and controversial, and Jim has had the courage to stand up and say what others did not want to hear. He has acquired a credibility that very few scientists have. His success is due in part to his personality, in part to his scientific achievements, and in part to his refusing to sit on the sidelines of the debate. Hansen's award has produced the expected screeching from the deniosphere, including a rant so vitriolic that it caused the author to misspell the name of his own field (meteorologosts?, charicature? Ain't you never herd of no spelchek?) Apparently, the author of the rant is so blinded by his vehemence that he can't even get the name of the DotEarth commenter he's quoting correct, referring to him both as "Craig James" and "Craig Woods." How are we supposed to believe his data? I’d also like to congratulate Dr. James Hansen, of NASA GISS, whom was recently awarded the 2009 Carl-Gustaf Rossby Research Medal . . . Climate Progress provides kudos to Hansen and a set of links to his work. Climate Progress has analysis of, and a link to the text of, Obama's speech today announcing the new policies. 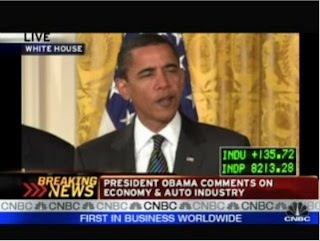 Video is available from CNBC. U.S. President Barack Obama will start reversing former President George W. Bush's climate change policies on Monday by taking steps to allow states to limit greenhouse gas emissions from cars and by ordering 2011 vehicle fuel efficiency standards to be set by March. It's one thing when an openly political organization trashes the science, but a meteorologist who is a Fellow of the American Meteorological Society ought to know better than to cherry-pick the Inauguration Day data. The cold temperatures in Washington on Inauguration Day have excited the anti-global-warming deniosphere over the symbolism: Obama's Inauguration was colder than Bush's! At least the Competitive Enterprise Institute's OpenMarket blog admits it's "not scientifically meaningful" (as if real science means anything to these folks). Just how random is this irrelevant fact? Instead of only 40 square miles of the District of Columbia, let's look at the 3,537,438 square miles of the entire U.S. (still merely a couple of percent of the entire earth's surface). While 9° below the long-term average, Washington's temperature on January 20 was far from the record low for the date. According to the National Climatic Data Center, out of nearly 6000 stations with at least 30 years of data, 6 new record low temperatures were set for the date, all except one of them in the state of Michigan. How many high temperature records were set? Forty-five, in Alaska, Arizona, California, Colorado, Idaho, Montana, Nebraska, New Mexico, South Dakota, Texas, and Wyoming. Want presidential symbolism in the records? Besides the multiple records set in Texas and Wyoming, Mt. Rushmore, SD, broke its previous record in a 46-year history by 4° with a high of 62°. In South Dakota. In January. Too much cherry-picking to look at just one day? OK, here are the figures for the entire month of January so far: lowest minimum records 399, highest maximum records 846. See here for other winter weather posts, including the spectacular breaking of the snow drought on December 19, 2009. Hurricanes, blizzards, and extreme temperatures get major headlines, but sometimes weather news is made much more gradually and quietly. With cold air again entrenched in the Washington area following a brief January thaw, computer models are quibbling over what is likely to be the last chance this month for some minimal frozen precipitation toward the middle of the coming week. 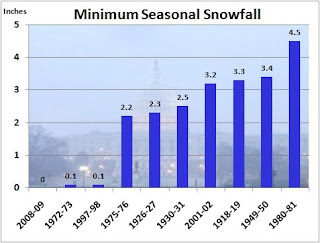 Although a trace of snow has fallen 5 times this January, including the day before the Inauguration, no measurable snow has been reported so far this winter in the Nation's Capital. That keeps the current season ahead of the record winters of 1972-73 and 1997-98 in the snow deficit department. In those years, only 0.1" was recorded. Besides 1972-73, only 3 previous winters have had no measurable snow through January: 1889-90, 1913-14, and 1959-60. The latter two went on to have over 2 feet of snow in February and March, with the majority falling in March both years. The last time measurable snow fell in Washington was on Feb. 20, 2008, when that month's entire total of 1.0" was observed. The current stretch of 11+ consecutive months without snow is the longest since the 12-month snowless streak from Dec. 10, 1997 through Dec. 22, 1998. Following the 4.9" which fell in 2007-08, this season needs at least 1.9" of snow to avoid breaking the record for least amount of snow in consecutive winters, 6.8" from 1996 through 1998. 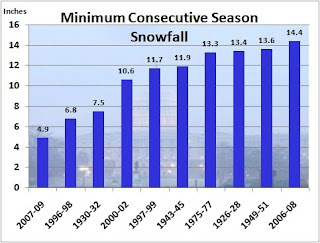 Not counting this year, the previous 2 winters from 2006 through 2008 have the 9th lowest total. The combined 14.4" for the last 3 winters so far is 4" below the record minimum for 3 consecutive seasons, 18.4" from 1996 through 1999.